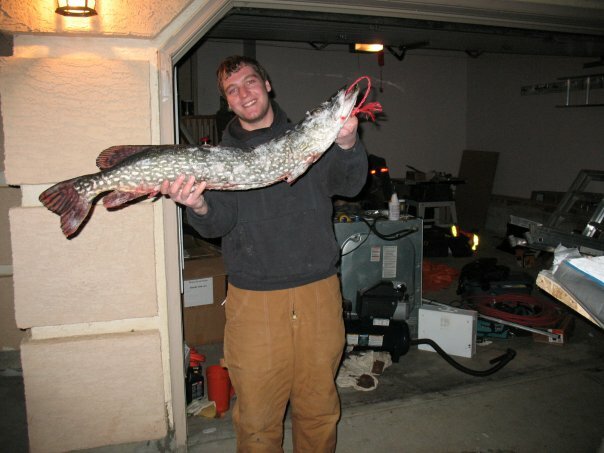 My son is in Calgary and doing alot of ice fishing for pike, this is his best caught the other day, a nice 32 pounder for his wall. Yesterday he text messaged a couple of shots with an 18 and 22 pounder. Of course, all have gone back with the exception of this beauty. Damn kids, sure make the old man jealous!! Niiiice... but I highly doubt it is anywhere close to 32lb. if I was a betting man I would say closer to 10lbs... perhaps you mean 32"? Gerrit, you are absolutely right, 23 lbs, damn fingers!!!! Had it on the scales in one shot close up on the scale, unless his scales are out of whack!! Another shot was it layed down beside the auger on the ice, nose to tail was the same length of the auger. Sorry for the typo, as large a mistake as it was!! You going to Simcoe tomorrow? Actually in Orillia at my cottage right now (Cooch), I have a crew going on the ice tomorrow! Tonight is fire pit and cocktails!! Look how happy and healthy your son looks...hahaha of course he is going to rub it in. The smile says it all!!! He is having the time of his life out there, between skiing and fishing he feels he is in heaven!!. I have had my boys on the water since they were old enough to stand up, we have fished remote areas together and they are by far the best times we have spent together. One phone call telling them I want to go on a fly-in and they are booking their tickets right away!!!! I cannot wait for the soft water action to begin, we are booked to fly-in again for a week of fun and frolic!! That's a beautiful pike your son got, congrats to him. My son always beat me 10 - 1 when we were fishing, but I loved every minute of it and the more he rubbed it in, the more fun I knew we were having. Very nice Pike. We'll see how much he likes it after the taxidermy bill. Maybe dad will help out on that.